The kidneys are important organs that have several functions in the body. The primary function is the filtration of waste products from the blood, but in the process, the kidneys also regulate the water and electrolyte levels in the body. The latter therefore impacts on blood volume and blood pressure. It can influence heart, nerve and muscle functioning and therefore cause a host of physiological effects in every organ in the body. There are a number of different types of kidney diseases that either affect certain parts of the kidney, the kidney as a whole or disrupt the function of the kidney despite there being no anatomical or physiological abnormality in the kidney itself. Globally, chronic kidney disease accounts for hundreds of millions of death globally. Kidney disease when severe may result in acute or chronic kidney failure, also referred to as renal failure. Acute kidney failure or acute renal failure is a state where the normal functioning of the kidneys are disrupted entirely or almost entirely. There is a rapid decline in the kidney’s filtration function which leads to an increase in metabolites (waste products) in the bloodstream. However, with acute kidney failure, the kidneys can recover normal functioning and the disturbances are therefore largely reversed, although medical intervention may be necessary. With chronic kidney failure on the other hand there is an irreversible loss of nephrons, the basic functional unit of the kidney, which leads to progressive and permanent disruption of the kidney’s function. The retention of water, waste products (metabolites) and electrolytes in the blood and interstitial fluid leads to hypertension and swelling (edema) respectively. The accumulation of specific substances, like hydrogen ions, potassium and urea, can be life threatening. Acute kidney failure is usually characterized by a decrease in urine output (oliguria) or even total cessation of urine output (anuria). In severe cases marked by anuria, death can occur in less than 2 weeks unless the cause of the acute renal failure can be treated or dialysis commenced. Pre-renal – where there is a disruption of processes, often associated with blood flow, prior to reaching the kidney. Intra-renal – where the abnormalities lie within the kidney, usually a result of damage to the kidney tissue. Post-renal – where the abnormalities lies in one or more parts of the urinary tract that carries urine away from the kidney, often associated with a urinary tract obstruction. The kidneys receive approximately 1 liter of blood every minute which is constantly filtered (glomerular filtration). 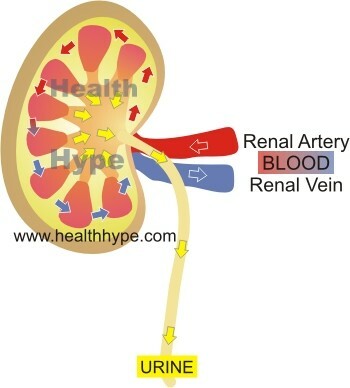 If the blood flow to the kidney is reduced, then the glomerular filtration rate (GFR) decreases and there is an associated reduction in urine output (oliguria). Loss of blood volume, which may be associated with bleeding, fluid loss in diarrhea or severe vomiting, or following burns. Reduced blood flow to the kidney which may be due to narrowing of the renal vessels, or an obstruction within it, like a blood clot (thrombus or embolus). Heart failure. The heart’s ability to pump blood is reduced (cardiac output) which leads to less blood reaching the kidneys. Severe hypotension (low blood pressure). May arise for various reasons including shock, overdose of certain drugs or illicit substances and/or severe infections. It is important to note that the reduction in blood flow that leads to acute renal failure does not immediately lead to damage of the kidney tissue. As the blood flow drops, and subsequently the glomerular filtration rate (GFR) decreases then kidney cell’s demands for oxygen are also reduced. Therefore then kidney cells can sustain itself with a lower blood supply without any cellular damage (ischemia). However, if the blood flow drops below 20% to 25% of the normal volume then tissue damage may occur. Glomerulonephritis – damage to the glomerulus of the nephron. Tubulointerstitial nephritis – damage to the tubule of the nephron and/or intersitium surrounding it. A kidney infection (pyelonephritis) may also be a cause of acute renal failure.